A fantastic 4 way radio controlled car - "In a Can" These clever little cars measure just 6.5cm in length and travel at a terrifying speed. Ideally used on a flat smooth surface, control is accurate and responsive. The headlamps light up when the car moves forward and tail lamp lights when the car moves in reverse. All cars come complete with 4 traffic cones so you can make your own time trial or obstacle course. Great fun in the dark as the LED headlights provide enough light to allow night racing. Packed in an excellent casing which resembles a coke can and hence the name Coke Can Mini RC Car. The can is designed to protect your car when not in use. The packing contains - RC Car x 1 - Remote Control x 1 - Antennae for Remote Control x 1 - Operating Instructions Sheet x 1 - Road Blocks x 4. Handset requires 2 x AA batteries (not supplied). The car is charged from the handset - see illustrations below. 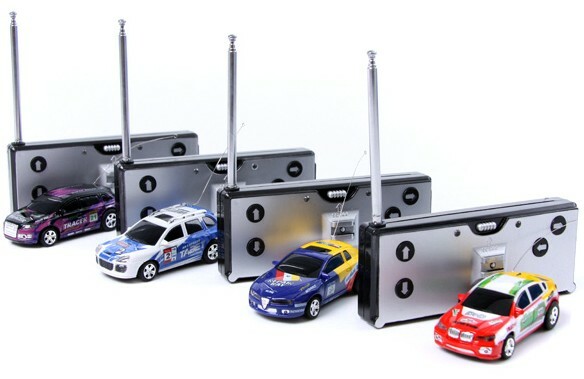 When ordering, please select different frequencies to avoid interference between cars racing at the same time - 27MHz, 35MHz, 40MHz and 49MHz. Colours and styles may vary due to availability. The important factor is to choose different frequencies. If you order more than one car, we will vary the colours and designs as much as possible. (More images & info below).